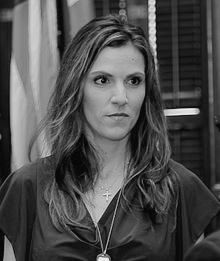 Taya Kyle is an American Daughter, an American Mom and an American Wife that women throughout the world can feel a connection with. As a focal point for military and first responder families throughout the United States, Taya has become a beacon of light for women through displaying her tenacity, strength and faith in God in steering her family through tragedy. Following on from the heartbreaking, sudden death of her husband, Chris Kyle – the author of New York Times best-selling book and Academy Award-winning motion picture, American Sniper – Taya has worked tirelessly to extend his legacy to the American people through the Chris Kyle Frog Foundation. The Chris Kyle Frog Foundation aims to build a highly connected network of military and first responder families through meaningful interactive experiences. In her own right, Taya has become a well-respected figure for military and first responder families and American women through appearances on the likes of Patriot Tour with Lone Survivor Marcus Luttrell and regular media appearances representing Chris and the Foundation. Taya’s story, American Wife (released May 2015 – HarperCollins), has given Taya the platform to tell her story, while also teaching on grief, faith and love. It represents the opportunity for Taya to be more deeply connected with American women, tell her story and use her experiences to help others.